American Chemical Society meeting reveals breakthroughs in sepsis, diarrhea detection and treatment. Color changes in a simple new “artificial nose” device can detect and identify blood-borne infections faster than current tests. Rampant disease, dirty water, limited medical access, poor sanitation—when you look at some of the problems facing the developing world, their staggering scope seems to call for equally large solutions. But in fact it’s the small, simple fixes that provide some of the biggest gains. At least, that seems to be the theme this year at the meeting of the American Chemical Society, where two new tools are making waves for the potential they hold for the developing world. First up, everybody’s favorite whole-body inflammation—sepsis! Caused by severe infection, sepsis afflicts millions of people each year where it kills as many as 1 in 4. In the United States alone, it’s responsible for 250,000 deaths and $20 billion in medical bills each year. Current testing requires incubation of blood samples to look for the presence of certain bacteria—a process that can take up to 72 hours. “By then, the patient may be experiencing organ damage, or may be dead from sepsis,” Dr. James Carey said in a press release. To improve on existing technology, Carey and his team from the University of Illinois and the National University of Kaohsiung in Taiwan focused on creating an artificial “nose” in a bottle. Apparently, sepsis bacteria puff out telltale odor molecules. When a blood sample is put into the test bottle and agitated with vibration, it encourages bacterial growth and, of course, its stinky side effect. 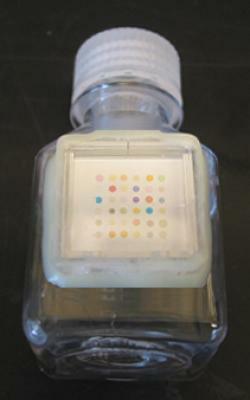 The sensor strip within the bottle has a series of 36 pigment dots that change color when certain bacteria are detected. The whole process takes just 24 hours, cutting the testing time down to one-third of its current rate. It’s also cheap. The other big deal in a small package to come out of ACS is a water purification packet that you just have to see to believe. The teabag-size packet is meant to save the more than 2,000 children who die every day because of diarrheal illness. You just pour the tiny packet into 10 quarts of contaminated water and stir for 30 minutes. The chemicals within kill microbes and cause dirt, parasites, and other particulates to drop to the bottom, leaving high-quality agua up top. Just watch. The packet technology has been in development for about two decades and is sponsored by a robust coalition more than 100 organizations and governments, with Proctor & Gamble’s nonprofit, Children’s Safe Drinking Water, at the helm. Behind the technology, you’ll find the same chemicals used in water treatment here in the United States—ferric sulfate to coagulate the nastiness and calcium hypochlorite to disinfect it. The powder is proven to remove more 99.9 percent of protozoa, 99.99 percent of common waterborne viruses, and 99.99999 percent of common waterborne bacteria—yes, that’s five freaking decimal places, or millionths. All that from one little packet of powder. For just $7.50, you could give a kid clean water for a year. I don’t mean to make it sound like everything presented at ACS this year has been humble. The conference’s theme is “Chemistry in Motion,” including presentations on the science behind the Indy 500 and diesel made from chocolate waste. (The conference is in Indianapolis.) They even scored a real-life race car driver to speak at Monday’s session. Still, I think if you’re at ACS and collecting souvenirs, you could do a lot worse than a sepsis-sniffer and a packet of magic powder.